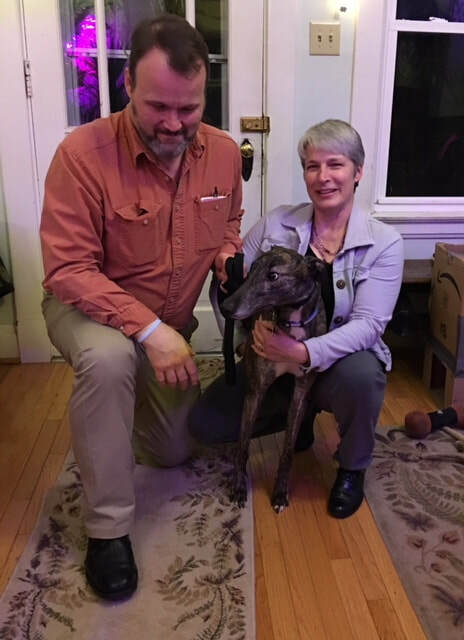 Bobbie Jean, now known as Celeste was adopted by Ralph and Ruth who live in Deer Park, they wanted a friendly, affectionate greyhound and Celeste is the right fit for them. They have two sweet cats, CocoMaru and Spark (who weren't interested in the family photo) Celeste walked into her backyard and peed immediately, could be because we got lost finding her HOME! (my fault) and then was excited to go inside to check out her forever home, beds everywhere! Ruth wants a cuddler, so she put Celeste on the couch hoping she would learn it is OK. This family has had multi dogs in the past, just loosing one recently, perhaps Celeste will get a new friend soon.